Oh boy. Perhaps drinking until the wee hours of the morning on a Sunday night at a wedding was not the smartest thing in the world to do. Hungover? You bet. Tired? Barely keeping my eyes open at work. I’ll never drink again (until next Saturday, when we have to go to another wedding). So yes, MAYBE it was a tactical error to do this when I’m 33 and have a four-month-old kid. Maybe. I won’t commit to this idea, but it seems at least plausible. I probably just have the stomach flu. Yeah, YEAH that’s it! I’M BACK BABY! So nothing today for you, dear readers. Please do me a favor and read quietly, as I’ll be slightly dozing at my desk with my eyes open for the rest of the day (learned it in the jungles of Danang, where the enemy never slept). So go read the Liberty Bell piece we published last week. Probably the best story we’ve ever done. The next target of Broad Street Media? Philadelphia, PA – Just a day after acquiring the Philadelphia City Paper and announcing it would shutter the publication and delete most of its archives, ownership representatives for Broad Street Media revealed they have their eyes on acquiring another Philadelphia institution. 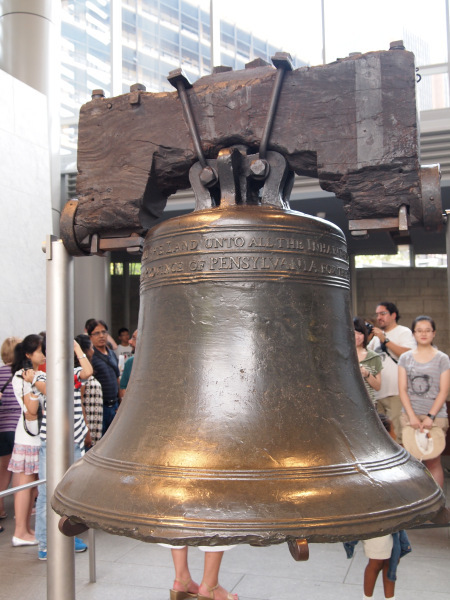 “Why should people get to enjoy the Liberty Bell when it’s a direct competitor to us? Sure we could leave I t like it is, people do love it, but how would that make us money? When I look at the bell, I can’t but help to think that we could bring in some fabulous revenue by selling ads on all that open space. It doesn’t matter if they’re on the front, or the cover of the bell, if you will. It’s not that big of a deal, it’s just an old, run down bell, nobody cares. We know best,” Corsetti said, dollar signs spinning through his sunken, sallow eyes. Philadelphia, PA – In what can only be described as a miracle, Pope Francis cured the Liberty Bell of its debilitating crack prior to leaving the city today. “He passed Independence Hall and onlookers inside said the Liberty Bell no longer had its crack. Unbelievable,” Mayor Michael Nutter said Monday. The bell apparently was cured of its crack after Pope Francis nodded and waved his hand towards the tourists who were looking at the tourist attraction Monday morning. Francis declined to comment, but only winked and nodded to the reporters when they asked him about the apparent miracle.